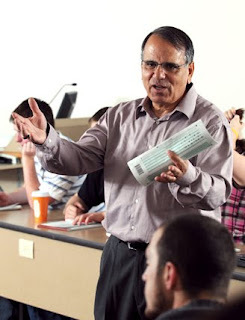 Raja S. Tanas, a Whitworth professor and department chair of sociology, has been invited to give the plenary address at the third annual International Conference on Interdisciplinary Research, to be held in Klaipeda, Lithuania. The April 9 conference, "Responses to Cultural Homogeny: Engagement, Resistance, or Passivity," will take place at Klaipeda's LCC International University, formerly the Lithuania Christian Fund College. Tanas says participating faculty will hail from the U.S., Canada, Lithuania, Albania, Switzerland and various African countries. Students in attendance will be from all over the world, he says, including a handful from the Middle East. During his lecture, "Responses to Cultural Homogeny: The Case of Palestine," Tanas will discuss defining moments in the history of the Middle East region, anti-Semitism in Europe, the British mandate in Palestine, and the June 1967 war between Israel and its Arab neighbors. More specifically, Tanas will address how the outcome of the 1993 Oslo Accords, which resulted in a plan for a two-state solution, now appears to be obsolete. Rather, he argues that the obvious outcome for the present is one bi-national state, which would serve as shared homeland for Arab Palestinians and Jewish Israelis. "This bi-national state will be a place where no one group of a particular religion, ethnicity, or national origin dominates the political organization and administration of governance," Tanas says. "Knitting the two flags of Palestine and Israel together would give rise to a third flag of a country that may be called Pal-Is or any other name." Tanas will conclude his lecture by urging the European Union, the U.S., the U.N. and Russia to work tirelessly to bring the Palestinians and the Israelis together to work, to live, to discover, to enjoy, and to benefit from the richness of their diversity within unity. "When we address the Palestinian-Israeli conflict, our orientation ought not to be pro-Palestinian or Pro-Israeli, but pro-justice, for God calls us to do so in Micah 6:8," Tanas says. The verse reads: "He has showed you, O man, what is good. And what does the Lord require of you? To act justly and to love mercy and to walk humbly with your God" (NIV). Joining the Whitworth faculty in 1983, Tanas has carried out extensive research in the area of Middle Eastern and Islamic studies. The graduating senior class of 2010 voted him as the most influential male professor for the 2009-10 academic year. Since 2007, he has served as chair of the Whitworth sociology department. He was listed in the 1998 and 2000 editions of "Who's Who Among America's Teachers," and in 1989 he received the Burlington Northern Faculty Achievement Award. He is currently serving a five-year appointment with the Idaho Humanities Council Speakers Bureau on Middle Eastern affairs. Raja S. Tanas, professor and department chair of sociology, Whitworth University, (509) 777-4516 or rtanas@whitworth.edu.